Thanks to a benefactor I met on one of my photo tours to the southern United States 2 years ago, I’m part of a team making a movie based on my photography about Gaza. The movie will be primarily about Gaza—thru my eyes, my lens, my craft. Eyewitness Gaza is our tentative title. Tom Jackson of Joe Public Films, widely experienced in making documentaries about the Middle East and the environment, is our director. To make this movie our team first recorded an interview with me during the summer of 2010 at the Quaker meetinghouse in Cambridge. Topics ranged from what I intend with my photography to how and why I began this project. We chose the setting because of my Quaker orientation. 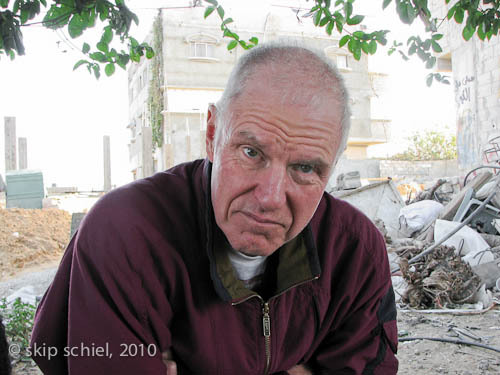 At the end of 2010 I was in Gaza for nearly 6 weeks, also Yaffa, Tel Aviv, and Sderot (the small Israeli city near Gaza that Gaza militants have hit repeatedly with homemade Qassam rockets)—primarily to produce video showing me making photographs and teaching photography. We concentrated on daily life under the siege and during the internal violence, non-violent resistance to both, humanitarian services to afflicted people, and the Quaker Palestine Youth Program (run by the American Friends Service Committee). My photography teaching is a way to enter more directly the lives of university-aged youth and to help them learn tools for showing their own experiences. We’ll include context, mainly history that acknowledges the severe violence and human rights’ violations of the past century, and also the longer history that indicates how the land has been shared for millennia. We use personal stories whenever possible: Omsyat, a young woman living in a tent after Israel demolished her home more than 2 years ago, saying how she is afraid to be happy; Ibrahem, a close friend of mine nearly killed during the factional violence, revealing his pain at knowing his own people shot him; and how Mohammed, a young man who lost both legs when hit by Israeli machine gun fire persists, as a photojournalist. In Gaza we hired a local crew headed by Adham Khalil, gifted in developing leads with an eye on video possibilities, and close to many of the programs we wished to include. We hired two local cameramen, Josef Nateel and Mohammed El Majdalawi. Thus our personnel were all from Gaza, intimate with life there, sharing their experiences while using their multiple talents. 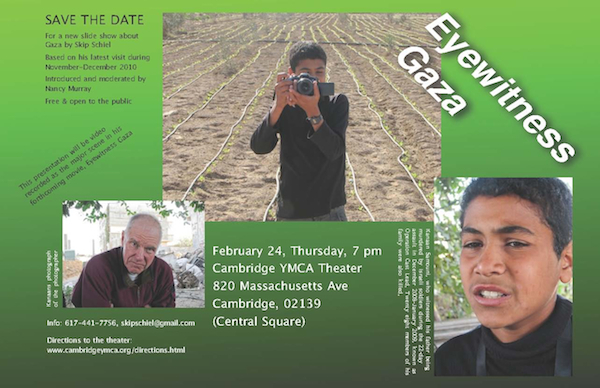 On February 24, 2011, I’ll present my new slide show based on recent photos and stories at the Cambridge YMCA Theater. Several video crews will record this event, including possible hostile discussion. 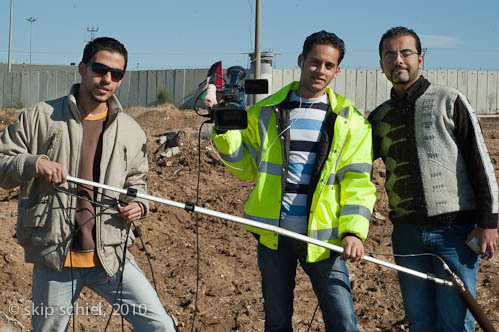 That footage will be edited with the Gaza and earlier interview footage to make our documentary. Al Gore’s laudable movie, An Inconvenient Truth, has been a model for us, basing his movie on his much shown and acclaimed slide show about the environment. As his movie is about the environment and his related educational work, our movie will be about Gaza and my related photographic work. We have high hopes for our movie: festivals, theatrical showings, distribution via the Internet, wide use by activist groups, and general distribution. We hope it will play a significant role in ending the siege and internal violence by opening more people’s eyes to a reality that scorns international law, humanitarian rights, and civility. As Martin Luther King Jr said, silence is complicity. We plan to help end that silence. To give you some sense of our recent feelings about our work I conclude with letters from Tom Jackson, the movie director, and myself. I finished uploading the footage from Skip’s recent trip to Gaza. The production team in Gaza did an excellent job and we have a lot of good material to work with! Thank you, Adham, Jozef, Hesham, and Mohammed for doing a great job! Our next step is filming Skip’s presentation in Cambridge, Massachusetts on February 24. We have rented a theater, and I have put together a team that is experienced with a multi-camera shoot which will go a very long way in terms of creating a sophisticated framework with high production values for the documentary. After that, we begin editing. This is a wonderful project to be working on, and I believe it will help to educate many people, particularly here in the US, about the injustices ongoing in Gaza and Palestine in general. Many thanks to all of you for your roles in making this documentary happen! you just wrote an excellent overview of our project. thank you. i happen to be watching the footage myself right now, as you wrote and sent. providential? my main concern currently is that we have everything that we shot. let’s hope. the darag team hip hop group interview and performance are particularly moving, it speaks for much of my experience in gaza. we should add to the list of thank you’s all those interviewed such as ibrahem, all those speaking such as amal, tech support people like islam, consultants such as mona, funders like yazan and lin, and all those appearing whose names we might not have like the vivacious head teacher in the kindergarten. i can adapt my footer from goethe to read: those who do not expect millions of viewers should not video record even one second. more later. we are moving forward. onward!